Oceanfront 1 BR sleeps 4 with a queen-size bed and queen-size hide-a-bed. Top floor of a 4-story resort providing for a spectacular unobstructed ocean view looking directly across the 10-mile Auau Channel to the island of Lanai. This very clean and well-prepared unit has a large private balcony facing SW with a chaise lounge, table and chairs. The unit has a shower-tub combo, dining room, full kitchen, a queen sofa bed in the living room, and access to a well-kept coin laundry one floor below. The sound of the ocean is continuous – even from the bedroom. south. 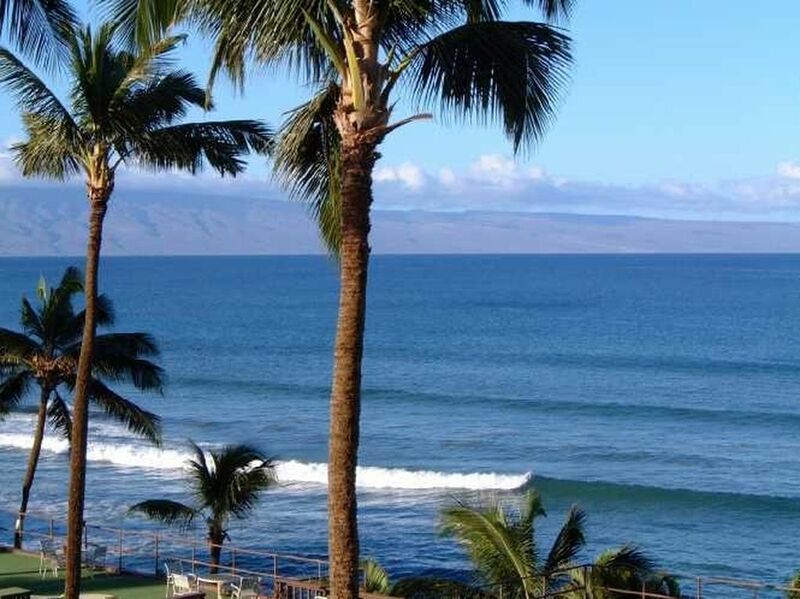 We are owner-operated allowing us to offer you the lowest oceanfront rates in West Maui. This unit has high speed wireless internet and is a “no smoking” unit. For our first trip to Maui, my boyfriend and I decided to split our time between the West and East shores. We stayed in Napili for three unforgettable nights. The beaches on the west shore are phenomenal, (our favorite was a little more secluded and includes a small hike down to Slaughterhouse beach just 5-10 minutes from the condo). The sunsets from the condo were absolutely stunning, the sun sets just between Lanai and Molokai. We saw tons of whales, turtles and rainbows throughout our stay here. I highly recommend this condo if you are wanting to stay somewhere affordable with a great view on the west shore! We will definitely come back! Hawaii was great, our condo had a great view of the beautiful ocean which we got to see whales almost every morning & sea turtles. Just amazing!!! So glad you enjoyed your stay! The view and sea life are fantastic. We were here for a month and enjoyed every minute of it. The condo was clean and comfortable. The view is spectacular and we saw lots of whales from the lanai. Great value. Beautiful view, great location, can't beat the price! We love this condo! We saw sea turtles every day! The view is amazing! Definitely would stay here again! Located in a perfect area of Maui. Clean and comfortable. Would stay here again. One of the best condos in Maui! A beautiful condo with amazing views and great location. Exceptional value! Cancellation policy is available on our website.